I’m the Tiger. What are you? All those chopsticks and duck sauce packets you’ve been hoarding for years? They’re all from one mysterious company in White Plains, New York. Growing up, every restaurant had its paper placemat. Sergio’s and Gino’s had a map of Italy with illustrations of the Tower of Pisa, a Venetian gondola, and the Colosseum. Generically Richmond restaurants had similar map of the Commonwealth of Virginia graced by cardinals and dogwood branches, the state capitol, the House of Burgesses in Williamsburg, and the Blue Ridge mountains. King’s Barbecue in Petersburg had advertisements from local funeral parlors. I remember Acapulco having something similar but Mexican, but my memory grows hazy with age. 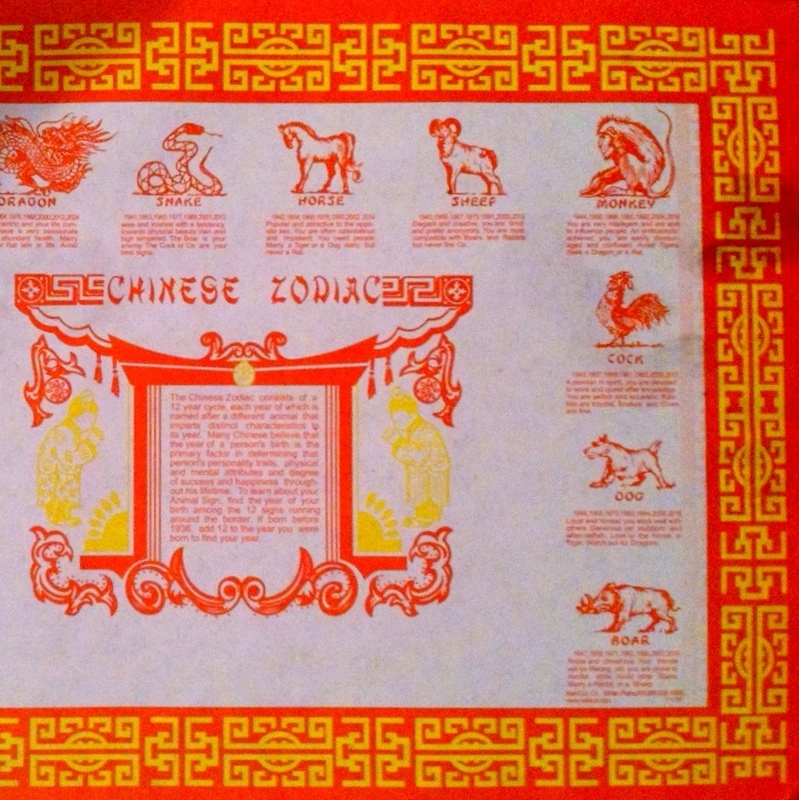 Yen Ching had a version of the zodiac printed in bright red and yellow, an ancient and complex system of astrological philosophy reduced to a series of lobster sauce-stained horoscopes. Born in 1986, I was the Tiger – aggressive, courageous, candid, and sensitive. (Wonderful attributes all, but vague and some maybe not entirely me.) I was to look to the Horse and Dog for happiness and avoid the Monkey. I haven’t been to Yen Ching in years, but the placemat has followed me from Chinese restaurant to Chinese restaurant, from city to city. I’m still a Tiger, still told I’m aggressive and courageous and candid and sensitive. I’m still on the lookout for friendly Horses and Dogs, and I’m still wary of people born in 1944, 1956, 1968, 1980, 1992, and 2004. Only two things have changed: first, the years listed (I get closer to that dreaded day when I’ll have to add twelve to the year I was born); second, the addition of a URL for Kari-Out Company. The other half of the zodiac. The company was founded by a Jewish guy from the Bronx. According to a 2001 profile in Fortune Small Business, he became “fascinated with small-unit packaging technologies” while working for his father’s tea bag enterprise and began distributing travel-size toiletries to hotels. After a brief stint developing packaging for a chemical company, he purchased a company that supplied popcorn to movie theaters. Around 1968, a salesman who sold tea bags to Chinese restaurants for his father’s company asked him, “Why don’t I sell them soy sauce for you, too?” And so he repurposed plastic sheathing he’d used years earlier for freeze-pops and sold them nationally “just as Chinese takeout was becoming a phenomenon in suburban America.” Duck sauce and Chinese mustard followed, the company branched out to a broader array of restaurant supplies, and the rest is carry-out history. The “near universality” of the company’s products remains a testament to “the company’s huge market share.” That explains the inevitability of the red-and-yellow zodiac placemat, one of the company’s most identifiable calling cards. It’s so identifiable, it has even spawned copycats. Given the well-documented symbiosis between American Jews and Chinese-American fare, there’s a Jewish zodiac placemat available for $5.00. (I’m Schmear. I “blend well with others but often spread [myself] too thin.” I’m a “smooth operator” but “could using some spicing up now and then.” I’m compatible with Bagel and Lox and “wouldn’t be kosher” with Pastrami. What are you?) Apparently the zodiac placemat also makes a lovely handmade birthday card, but who sends those anymore? Carry-out container. Image courtesy of Flickr user Muffet. A nice letter, right? An exclamation point at the end, even – an orthographic smile. But no dice. So who knows where the design came from? Maybe some takeout Harry Beck designed it way back when – a tube map for your future happiness – and has been dutifully updating the years ever since. Maybe the placemats have been hand-printed by Himalayan villagers from time immemorial. Maybe the design is an original Warhol. Maybe I’ve just been imagining it all these years. Whatever its history, the placemat goes to show that the experience of food is about more than just the food. 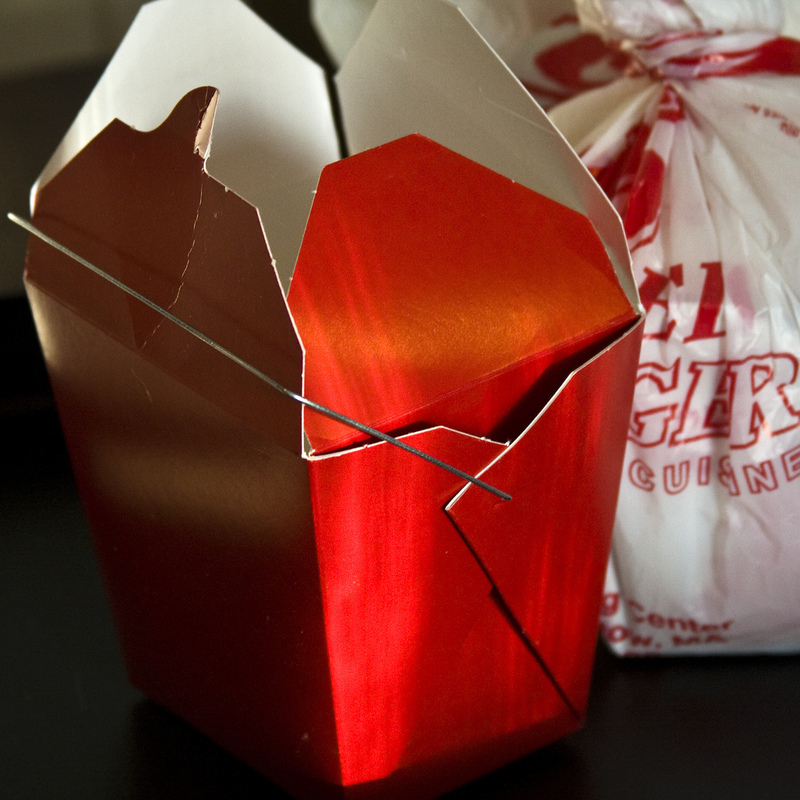 Chinese-American food, too often maligned as somehow inauthentic, is a nostalgic endeavor wrapped in intricately folded pale pink fabric napkins, smooth versions of pop music classics, and omnipresent Kari-Out-brand red-and-yellow zodiac placemats. We have only one Chinese restaurant here in Trapani. They put the take-away food in aluminum foil. Such an interesting post. I really enjoyed reading it. I always wondered why all the Chinese restaurants had the same place mats! I’m a dog. 1970. And I should beware of many. Interesting post! Here in Ireland we get Chinese roll-out calenders free with a take-away. They’ve been around forever, I must look into it. I travelled a lot to the States when I was young and would faithfully collect these place mats. I still have them somewhere in storage! We take for granted the small things, but on occasion they are interesting and have depth. Thank you, I wondered about the mats. I also wonder who the seers are that do the fortune cookies. They are always right on. I miss those placemats! I can’t remember that last time I had one. They go with restaurants that serve food on funny stainless steel containers. Ah, good times, good times. Sadly, I am chopped liver on the other zodiac, and I thought being a rooster was bad. Thanks for sharing. Great post! Very nice to share this! very fun & interesting post! 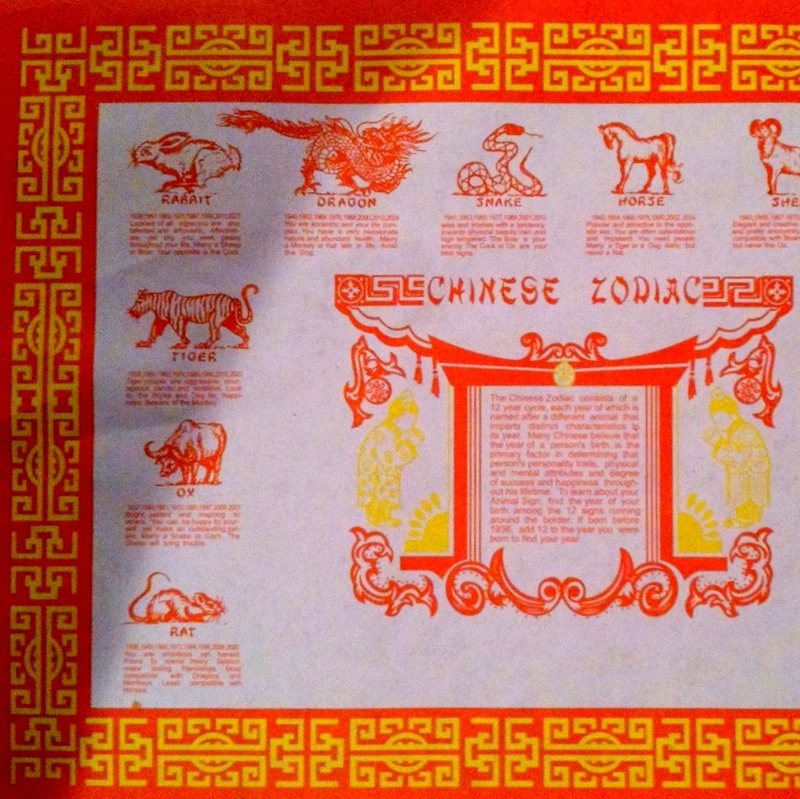 the zodiac placemats at Chinese restaurants have been a favorite treat of mine since childhood and a consistent table setting accompanying my egg rolls and Kung pao entrees all these decades. Good post. After reading this I had to check my animal and it turns out I’m a sheep. The description is surprisingly accurate. I’m a little creeped out.